A few of the scientists in OUR community follow his comments with interest. always wondered why Elon was so quick to get us off the planet or would be in the tunnel business ..Usually nightmare regulated..
but he is getting permission to tunnel so easily ?. perhaps just a cover for ever ambitious tunneling projects ?? maybe the Parker probe is trying to get a better grasp on the actual timeline ? My friend in Russia was also dropping magnet down a pipe last year. Difference is he started getting ''DUST'' out of his pipe even tho pipe itself hasn't lost any weight. and I would say the 2 are at 90 degrees to each other. I think it is correct, but also remember this is a reinvent of a very well known idea. Sorry for the delay, had a few computer problems, but mostly I just needed to take a time out. I know my brain will figure it out all by itself if I just let it do what it's supposed to instead of constantly trying to force it. Mainly I was passing along a thought. That being the machine is pre-solid state and so it's probably electromechanical. However, how exactly that would work I haven't deduced, or even if it's possible or necessary, but something to think about. I was reflecting on the inner spiral tubes of the central column while babbling. I think I now have about half of this worked out theoretically speaking. The ARV uses a combined propulsion system consisting first of a closed cycle electromagneto drive as outlined by Oleg D. Jefimenko and as demonstrated by Ken Wheeler. This is the Central Column Tube which contains a gas or fluid that will produce the effective same results as shown in the magnet being dropped down a tube. Only of course we are forcing this to happen via an electrically powered series of magnets which provide the reaction by being set off in a repeating cascade. The speed of the cascade and the substance that reacts with the electromagnets together determine the reactive force. At the bottom of the ARV are the Pie Shaped Quartz Plates. This is the secondary part of the propulsion system. Here I'm speculating based on what I now think I understand. Please keep that in mind. This is probably not right and will change as knowledge increases. Right now this is what I think is happening. The magnetic and electric are transferred via wireless (*see big pit with wire's that the tube sits in) which is carried out wards. This energy is evidently aided in evacuation with the help of a large electromagnet which surrounds the exterior about half way up that forms the walkway where the crew compartment door is located. As the energy is passing through the so-called capacitor plates the quartz creates a gravitational mass. *Note; so it's a flat earth right? Kind of interesting how that works huh? In the ARV design most of what is understood is turned inside out. This is a little confusing how this works because according to theory the energies of space and counter space move towards the center. For this reason these plates and the way they interact with the column stymied me for a while. You would think that the energy has to move inwards and those pie shaped plates seem to strongly suggest that is what the design was intending, but after realizing how the central column worked I began to see how the reverse might be taking place. The center is still there, but it's the electromagnetic center, and it is within the central column. The plates create the false mass. Which say's that the behavior of the quartz is such that when energies pass through it a gravitational mass weight is induced and that gravitational mass is variable because it's controllable by the energy and speed of the electromagneto propulsion system. I know this is a little counter-intuitive but it makes sense in terms of explaining the reports about the scale and speed of this design. Wherein, supposedly the bigger they are, the faster they can travel, and so there appears to be some logic going on with the idea because Quartz (evidently) perturbs electromagnetic energy the most and can therefore create an artificial mass (false mass). We already know there's truth to this because it's long been known that area's rich in quartz are infamous for the unexplained including levitation of objects in so-called poltergeists. Finally, when powered up and buttoned up for safety, the evacuated electromagnetic energy is pulled out of the bottom of the vehicle along the edges of the so-called capacitors with the assistance of an electromagnetic ring along the upper exterior and which rings the large aluminum disk forming the crew deck in the McCandlish Illustration. This aluminum disk and the location of the ring magnet is your big clue that more is going on than meets the eye because this says there is counter-space being taken back up to the core of the electro-magnet in the central column. * Ever wonder why someone would name a project winterhaven? Remember that almost all of Earth History is in Glacial Ice. Like I mean all of it. Not parts of it. Last edited by Gambeir; 03-02-2019 at 06:38 AM. temperatures can be examined more readily by experiments performed at low temperatures. Questions this raises include does synthetic crystallize quartz do the same thing, can the pie shaped discs just be replaced with an acceptable mass of quartz regardless of shape, inferior shapes merely lowering efficiency? What regions with quartz have the most stories of levitation? That would be the material to start with. Thank you, but just keep in mind that how I described the operation could be backwards. Meaning that the electromagnetic field should be a ball surrounding the vehicle much like a planet has, and it is intuitive that the pie shaped capacitors should be receiving energy from the outside and afterwards moving inwards to the center. Which would be the reverse of my previous statement of theorized operation. That is to say; which way does the energy flow through the quartz based pie capacitors? Since the machine is surrounded in a magnetic field I'm not sure which makes the most sense at this time. This is a demonstration of my own lack of knowledge. The issue of directional flow is one for those experienced in wireless power transmission to determine. The main thing is to see how the machine is like a planet when in operation. Notice here that there is a central core to the crystal binding the three outer crystal shapes together. Counter-spacial energies following the crystals pattern are taken inwards to a center point. So it appears that the geometry of the crystal is what is significant. Meaning that, in terms of understanding how counter-space moves through matter to escape from a central point, and thereby creating a magnetic field, it is the pattern of the crystals which matters: In this case a tetrahedron shaped crystal with a core point. Convergence of counter-space to a central point is what produces magnetism, and in an incoherent field of matter each molecule is independently creating a magnetic field, with the end result being the clumping of mass in a mass-mutual attraction of jumbled magnetic fields and creating a MMA (mutual mass attraction field). The end result being convergence at the core central point of that mass; ie gravity. Quartz is composed of silica and oxygen. Silicon dioxide is the most common element on earth and most commonly found in quartz. Most crystalline forms of silica are made of infinite tetrahedra. Refined it produces silicon; the basis of our modern world. The ARV is pre-modern: That's why there is quartz being used and not other material being used. Materials such as magnesium, also known as Elektron, and alloys of it, including Aluminum, were either not understood as related through crystalline geometry or were unsuitable at the time. Serious research and classification of crystals wasn't even begun until 1960 and my suspicion is the launching of a formalized study and classification of crystals was due to the realization that this is where the rubber meets the road. Now the problem I've found is that once you leave quartz crystals, once you go looking for a suitable replacement, there is a bewildering series of paths of bamboozling unrelated material connections involving conventional physics and these ideas about electrons, valance bonding, and on and on and on. I'm not convinced a single human mind can hold it all and make sense of it quite frankly. I think the real key is to search for connections between the geometry of crystals while keeping in mind the general idea about the way counter-space seems to be perturbed by patterns and flows through them, with evidently those having a converging point linking to outer crystals being the enabling point where gravitational/magnetic fields are generated. Last edited by Gambeir; 03-21-2019 at 06:16 PM. Or cold current: A blizzard of an idea huh? Last edited by Gambeir; 03-03-2019 at 05:01 AM. I forgot to say that the hubris of humanity is to seek to improve upon nature, a fools errand no doubt, and in that quest is this search for a better material. I'm not sure that's possible. Cheaper maybe, better I don't know, the evidence doesn't seem to support that idea. "UFO crashed on Hill 611 and debris was recovered which contained a matrix of fine gold wire substrate sheathed in quartz." Other examples are known. I know of at least one other report of ancient remains of what appears to have been an automated factory located in Russian. These factories evidently took in raw material searching for perfect stones, quartz evidently, with huge piles of rejects laying about. Thought to be tens of thousand or even hundreds of thousands of year old is what I heard. Sorry I don't have a link right now and I haven't gotten this story corroborated either but I have heard it reported in an unrelated areas involving so-called quantum computers. Also Quartz can be chiral; right and left handed. This is probably significant and important to keep in mind.
" Silicon is the eighth most common element in the universe by mass, but very rarely occurs as the pure element in the Earth's crust. It is most widely distributed in dusts, sands, planetoids, and planets as various forms of silicon dioxide (silica) or silicates. More than 90% of the Earth's crust is composed of silicate minerals, making silicon the second most abundant element in the Earth's crust (about 28% by mass) after oxygen." By mass, aluminium makes up about 8% of the Earth's crust; it is the third most abundant element after oxygen and silicon (in the Earth's crust)"
Last edited by Gambeir; 03-03-2019 at 05:51 AM. I want to refer people to the Newman Motor Finally Explained Thread. It has illustrations and information which I believe cross over to the ARV design. Last edited by Gambeir; 03-21-2019 at 06:19 PM. my first thought is that it is going to be quite hard to put 50HP of mechanical energy into a box that is also suppose to contain liquid helium. not so sure that device could work as shown, and if it can, then it will be out of the price range of almost anyone. the idea should be testable at room temperature and pressure. Posting this image can help us see shared properties with other ideas/designs & information. Really this is where I think it has value. It's supposedly called a Phonon Maser. This site explains a bit and give the link to the archived pdf where the device is explained by Volfson. Yttrium Barium Copper Oxide- YBCO is the crystal used in a so called MgB2 toroidal disk cooper pair generator and particle separator. Last edited by Gambeir; 03-09-2019 at 08:20 PM.
" Volfson explains that “In a flat, cooled superconductor disk, the electrons are bound into Cooper pairs energized at a ground level. Released into a vacuum, the phonons (initially formed to pair the electrons into Cooper pairs) affect the crystal lattice of the vacuum causing gravitational effects.” Though the effects are small, says Volfson, they can be amplified by means of his Gravitophonon Maser, which can produce a “… collimated, coherent, and all-penetrating beam of bundles of superposed guest phonons.”"
See, for me the question is what is really going on here because I have to discard Einstein's idea's about the causation of gravity. Gravity is incoherent magnetism as explained by Wheeler. According to convention, in Volfson's device the use of helium is for creating a super conductor, but we already know that helium is a superfluid as well: OK? It's not just cooling the so-called gravito-phonon disk and the explanation almost says as much by reference to some mysterious "guest phono's." So it appears that the vacuum disk, when exposed to a superfluid, is conducting unknown energies referred to as so-called guest phono's, and which are detected via the subsequent change in weight of the the mass. Last edited by Gambeir; 03-09-2019 at 09:14 PM. 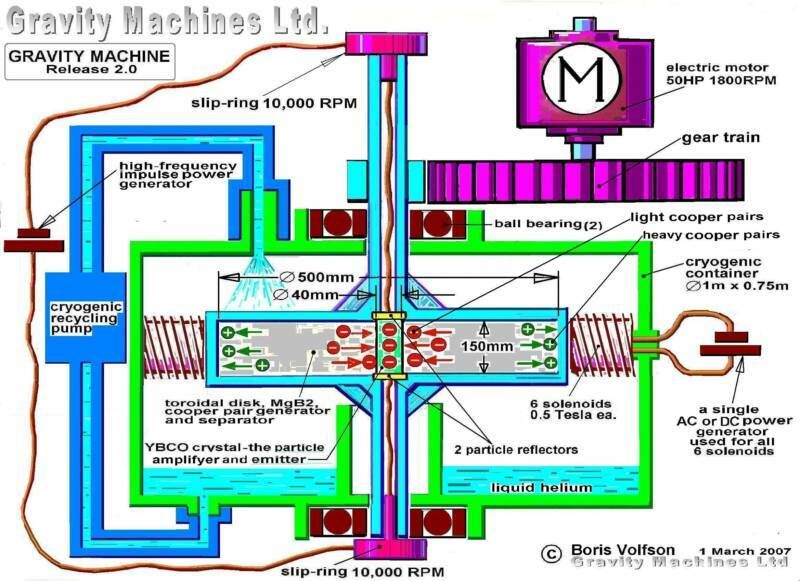 Now Volfson called his creation a Phonon Maser that operated via a so called MgB2 toroidal disk cooper pair generator and particle separator. Going back in our own thread to dielectric pathways; compare the Byron Brubaker's suggested improvements to the Joe Newman Glass Canister Dielectric Separator and then this to the Abductee's reports of the inside of UFO's of long clear tubes with winding and so on, and while remembering that counter-space is a dielectric energy field moving at millions of times the speed of light. "Helium could become magnetic if a glass canister were to be filled with helium and the canister wrapped with an open path coil not connected to anything, nor to itself, resulting in a momentary voltage gradient appearing in the coil twice per revolution and each appearance possessing opposite orientation of polarity. This may induce one of each pair of helium electrons to flip its spin orientation "
See how the Newman device shares great similarity to the reports given by abductee's of the gut's of a UFO. Last edited by Gambeir; 03-09-2019 at 09:29 PM. Dealing with complex issues requires simplified outlines in order to later assemble the puzzle in to a complete picture. As a result a simplified explanation for gravity, but fundamentally correct explanation, is that gravity is simply incoherent magnetism; with every molecule having a magnetic field and being mutually attracted by other disorganized incoherent magnetic fields: In my opinion this is now conclusive. Einsteinian ideas about gravity are not completely void, but are not primary causation's: Again, my opinion. The real question, because it's not just in materials which we can create magnets out of, but most all other matter has a magnetic field as well, is what produces magnetism and hence electrical energy in matter which isn't naturally magnetic: Which implies that something passes through matter which fundamentally powers it by creating magnetic fields/electrical fields. Fundamentally speaking, I would think that helium inside a vacuum would be expected to produce a gateway to the counter-spacial field. The quantum field as we know it today, and the so-called guest phono's that are referred to in the Volfson version of reality. The counter-spacial energy field is incoherent energy, which seems to be suspended in a vacuum, and in it exists a gas which can behave as a superfluid in liquid state. So now you have helium in a vacuum and we now know the little known fact that helium can become magnetic as well. What I think is that the use of helium applied to a vacuum produces a kind of Solitron; which enables the creation of link to counterspace's dielectric field. That field has no relative time or speed frame that we can relate to. This is where instantaneous action takes place as it does in the magnetic field. This infers that there is an unknown and probably unidentified transport mechanism involved if this conjecture is correct and it would mean that, if correct, superluminal transport is a given. Last edited by Gambeir; 03-11-2019 at 03:37 PM. The pressing issue is how to make this propulsion driver work since the obvious problem is that we need to have a magnetically reactive medium/gas, and preferably one that works at room temp. *There may be an alternative method but I haven't thought it through sufficiently just yet. So, I'm soliciting ideas and information and urging you to keep this propulsion system in your thoughts.The brain is both lazy and a fantastic liar as well. Be alert to it's tricks. Demand it do something useful and it might. I don't want people to think I'm not interested in how they think this works. What I want, what we all need, are ideas about how this can work, but we can't be going off into a completely different system of operation unless that is where this propulsion system takes us. I think the proposed propulsion system is viable and probably the right real system used. A propulsion system consisting of a closed cycle electromagneto drive (as outlined by Oleg D. Jefimenko and as demonstrated by Ken Wheeler) in which a Column/Tube contains a gas or fluid, and against which an electromagnet is driven in a cascading repeating cycle against a reactive medium, (*meaning a magnetically reactive medium), and which does itself (the gas) then cycle in a loop fashion, returning to the beginning via an interior tube/column, and so a tube in a tube which forms vertical looping pump. *BTW, the is perfect description of the 1950's South African Ufonaut's statement that the propulsion system was very simple, stating that as the material which drove the Ufo was entering it was also leaving: This is the very description of a cycling pump. The problem we are facing is what is the gas being used as the medium because logically it should be a gas that can react to a magnetic field. Any ideas, thoughts, tidbits of information, ect on this should be posted. I think we are now at a point where there is a viable explanation but are lacking some crucial bit of information on how to make this work simply because I am pretty sure this isn't half as complex as it first appears. All we have to do is to assemble a viable theoretical model and then build it. This is just like solving any other mystery. There's something here that is out there that will explain how this works logically and simply given what we now know. For reference there is this Energetic Forums Thread which people might also find useful. * Recommend post #8 by Dr. Poppy. How can you make a Magnetic Gas? Last edited by Gambeir; 03-14-2019 at 12:27 PM. If we can succeed in this propulsion system then maybe we the people can solve all our problems here on Earth by transporting politicians to Mars instead. Naturally I assume there will be others whom might be considered as well. Lawyers for example, possibly criminals though I'm not too sure that wouldn't be unusual and cruel punishment lumping them in with the first two, and possibly some other undesirables may be considered as well, mostly trouble making billionaires, but I think that's about it. That should pretty much clear the trash out. Guess we will have to cross that road when we all get there. Last edited by Gambeir; 03-14-2019 at 04:45 PM. something to keep in mind about the ARV when trying t figure it out. the passengers would likely be set in a zone that has regular gravity force or something near normal. so there is likely a large field that keeps it floating and flying, and a smaller reverse field that keeps the passengers ok.
seems to me that it is likely that they set up the smaller field in the central core, and did it in a way that also makes the power to run the entire system. and I mainly say this because of the comment that they could build them large or small, but could not change any of the overall design or it would not work. so, likely it is similar to the smart car, I doubt that any single component does just one job, it is not there unless it does a few things at the same time. I've been ignoring the Alexey Chekurkov Thread and just noticed Ufopolitics had posted a link to this video. This is a highly technical analysis. It appears that the author Mantim Lee thinks this is a real working machine which is supported by the physics involved. This is a repulsion machine if I understand the analysis correctly. So it's looking like flying carpet's may be in our future, or at least the futures of people younger than myself: Which sounds about right. Last edited by Gambeir; 03-15-2019 at 07:59 AM. Well I've been through the video once. Feel free to correct my ignorance, but the gist seems to describe it as being somewhat like the electrostatic forces which are involved in tornado's; with a core product of a negative ion vortex surrounded by a positively charged outer and upwards spiraling vortex. The evident difference being that the primary plate becomes a negatively charged superconductor, aluminum being superconductive capable, and producing a repulsion type of drive. That fits the Wheeler model of there being only two forms of antigravity; one being repulsive, and the other being a kind of false mass. At any rate, I don't think it's possible to actually understand why this happens without having this understanding of counter-space and magnetism as one and the same, whereas the Volfson contraption is perhaps accomplishing the same thing, sort of, but by a vastly more complex system. So I think it's helpful because he seems to have defined the type of vehicle it would be, which had me bamboozled, and so I appreciated the insight given. This may be useful too in looking at the ARV itself and that center disk. The puzzle is now seeming to have pieces which at least look like they might fit together even if we still don't have them properly fitted together. However, I'm mostly interested right now in a propulsion tube and here again I refer people to this thread. Specifically to this post by Dr. Poppy. "Oxygen is a magnetic atom (polarized) and is just like a magnet. O1 being magnetic bonds to another O1 atom to form O2. This unfortunately is like connecting two bar magnets which completes the magnetic path and the magnetic field is confined and weaker outside that path. An electrostatic discharge under the right conditions will cleave the atoms apart momentarily and produce a magnetic field. A laser can also be used. It is important to place the gas under a vacuum which produces acceleration and multipacitor effect which is electron cascade." OK, so what do you do when you don't have "LASERS" ....oh, let's see....humm....maybe you would make a cascading electromagnetic solenoid? We have to keep in mind that the ARV is a very primitive machine. One which in theory we should be able to make in a garage with tools from Harbor Freight. Seriously, I mean that, and BTW I love Harbor Freight. I got to think about this a little more but off hand we need a vacuum tube, with another inner tube, so that the inner tube cycles the material, going in one end out the other, flowing around the outside of the inner tube. This is virtually a precise description of the drive given to the poor unsuspecting Britisher in South Africa in 1950. I wish I knew if this Ufonaut had a German accent because I swear to God the dialogue sounds like it came out of the mouth of von Braun. Last edited by Gambeir; 03-24-2019 at 03:19 PM. By now those who have followed this thread should have firm idea's about the way this machine works. What I think is happening in this design is now provided in a simplified operational outline. A suitable conductive agent, previously mentioned as helium but probably something else, when driven by the solenoids creates a partitioned ion, and whose charges are evidently picked up by two counter rotating interior helix coils, somewhat replicating the magnetic, with the negative charges applied to the electro-optically reactive piezoelectric quartz capacitors, which holding a controllable charge are then repelled from the earth, and with the positive charges potentially applied to the outer hull. Evidently a large electromagnet is located around the outside about half way up and forming the deck where the crew compartment door is located, and this electromagnet might be operated in a rotational solenoid fashion, thereby inducing a rotation effect upon the magnetic field discharges which presumably exist outside the vehicle, and which are cycling as a magnetic field and being taken back up in side the vehicle via an accretion disk, shown in the McCandlish Illustration as the crew deck flooring and possibly made from aluminum, and this accretion disk then cycles exterior magnetic back to the inner core of the magnetic field: Where Counter-Space which gives rise to the magnetic field should be. This is my best guess so far as to how this machine operates. This speculation is based on all the information compiled so far. In the future I may be posting some illustrations and other material to help illustrate these thoughts more clearly. The basics of how this machine operates are now fairly clear in my opinion. However, a million times I've thought I've understood only be made an absolute total fool, which is why Universe and I have an adversarial relationship, as it insists it is my superior and which I refuse to accept because it's my job as a human being to refuse to acknowledge the manifest truth. Now it is true that there are areas which are unclear but over all I think this outline does fill in some of the fundamental operational concepts which underlie this design: We shall see who ends up wearing the Dunce Cap is what I say. One of the next key parts to understanding this machine is probably discovering what it is using in the central column; water, liquid air, liquid helium, other? Refer to the work of Henry Stevens; "Hitlers Flying Saucers" because I'm leaning towards water as the quote; "ionic fuel" source here. "A point of speculation should be made concerning the KM-2 device. was a suitable medium for his electrokenetic generator." 1950 South Africa Ufonaut begs for water? Ufo's predilection for clouds and apparent love of water as well. Last edited by Gambeir; 03-24-2019 at 04:15 PM. An Electrokinetic Generator is what we today more commonly call an MHD Generator. So ya know I simply highlighted "Electrokintic Generator" and did a search. Here's the same patent shown in the Henry Steven's book; "Hitlers Flying Saucers." T. Townsend Brown. 1957 Electrokinetic Generator. Priorly, the thermal energy of burning fuel has been first converted into mechanical energy of motion which in turn was used to generate electrical energy, the wellknown boiler-steam-turbine electrical generator arrangement being a familiar example. However, in accordance with this invention the energy of a burning fuel is directly converted into electrical energy. In accordance with other aspects of this invention, the kinetic energy of a stream of dielectric fluid such as carbon dioxide may be converted directly into electrical energy. Further, the principles of this invention may be applied to apparatus for the generation of very high voltages by a series of conversion devices. Still further, the electrical energy so generated may be employed as a motive force to propel the generator relative to the surrounding medium. It is a further object of this invention to provide a method and apparatus wherein a fluid stream is utilized to transport electrical charges from one electrode to another. Encyclopedia Britannica has some good images and overview information on MHD's. Observe Disk Generator D. in this image link. Last edited by Gambeir; 03-25-2019 at 10:24 PM. It does appear, though we cannot be 100% sure, that the Alexey is a repulsion type of machine. However, based on the calculations of Lee the machine isn't displaying the calculated thrust to weight ratio which Lee figured at over 8,000 lbs. A phenomenal figure which would shoot the Alexey in to space very quickly. There can be no doubt that Lee's calculations are accurate so answers must lie elsewhere. Therefore the issue arises as to where is this thrust if it's not being displayed? Here then are some ideas we have been tossing around. Really answers will probably have to come from testing and inventing ways to test these ideas for validity. We think that one possible explanation for this lack of thrust may have to do with the creation of counter space at the core of the Aluminum plate, and which is spread across/through the plate, and which then may produce a barrier to the Earths' Magnetic Field. Evidently most of the energy Lee's calculations put forward must then be engaged in the creation of a barrier to the Earth's Magnetic Field. I think that a high voltage high frequency charge applied by the Tesla Coil to the Aluminum Plate is likely the starter for this vortex opening to counter space. Bugsfly doesn't think its necessary or may not even be doing anything useful, and that this could all be the result of mechanical interactions, and he might be right about that too. Now we aren't sure that in fact a HF HV Charge must be used. It maybe possible do this all mechanically as theorized by Bugsfly. This goes back to his grinding action mill stone theory. Something to consider since phenomena in nature may validate this theory. The inspiration for this idea comes by watching this video of the supposed TR3# captured over Paris France about 7 or 8 years ago. It's the leaving Paris France part that counts. Notice how this resembles a "Star in Jar" the way it manifests, and notice that the core light is expanded and then pulled in to a complete sphere engulfing the machine by the three outer lighted sphere's. This is very good video and you can clearly see there are two fins on the top of the vehicle. This is not an alien space ship. It's clearly entering counter space in my opinion. Last edited by Gambeir; 04-09-2019 at 09:30 PM.